The unfavorable conditions have hampered our sugar makers this spring. 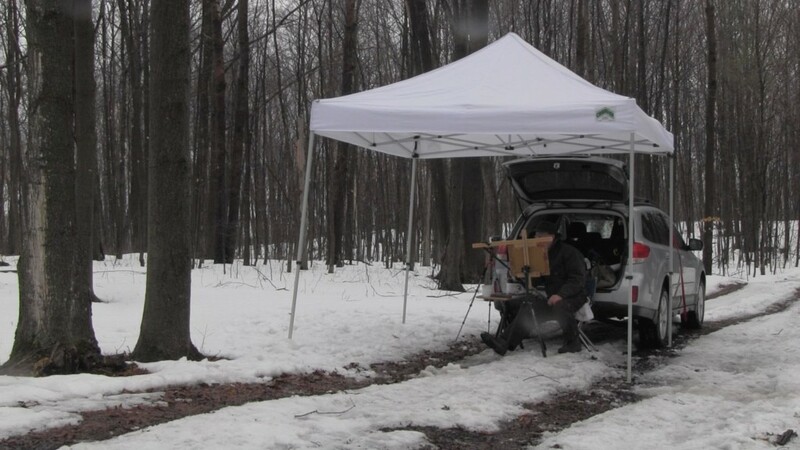 But as Vermonters tend to do in the face of any challenge, they’re making the best of it. The family operation at Triple T Mapleworks in Shoreham has been doing that… for about 100 years. 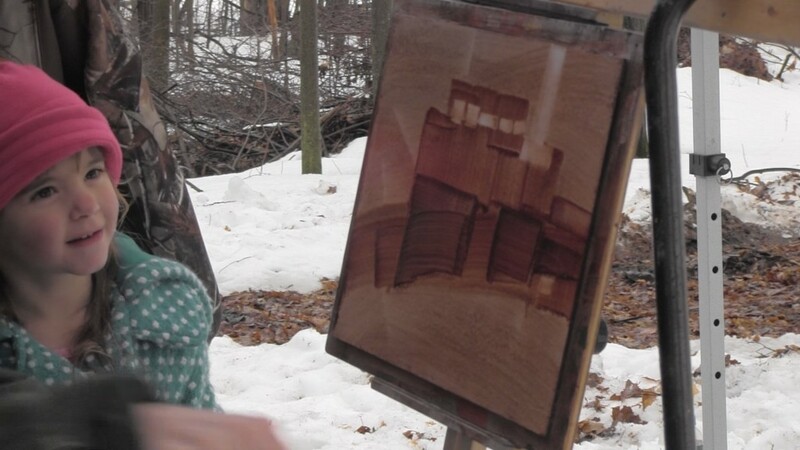 Painting and filming a video in the windy freezing rain last Sunday, Jackson and I made the best of it too. I could watch your videos all day long, wish it was real time, I get a little dizzy seeing it sped up! So much to soak in. Thanks for sharing all you do. Thanks Gail, I wish I could really paint that fast…think of how much i could get done! I absolutely love your videos. They momentarily take me back to your beautiful state. Fascinating watching you capture the setting. Was that a cane? I am up and feeling well from my surgery and I hope the same for you. I haven’t forgotten about you, my printer went down and I am in the process of repairing it. Glad to hear you are doing well Randy! The videos are all Jackson Whelan. He’s an artist with a computer and camera. I love doing them too. The cane is simply used to steady my painting hand usually in the later stages of a painting when I am making more precise strokes. Thank you Peter for this beautiful reminder of what Vermont is in the spring. 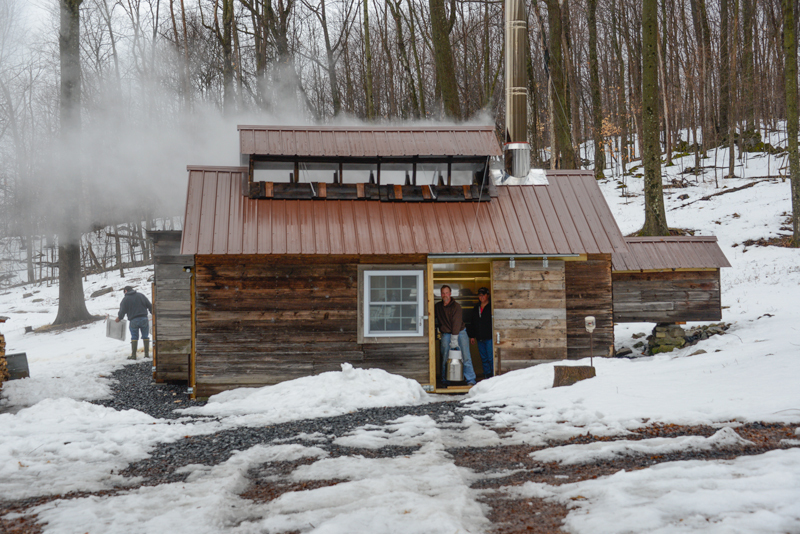 Maple Sugaring is such a tradition for many families, tourists, and school children to see. After recent news of the maple sugar can with the heroin addict on it, this brings it back to perspective on what Vermont is know for. Thank you Kathy. Yes I have seen the recent news and the sugar can. As long as I continue to have a choice I’ll look for and find beauty, and try to make a small positive difference where I can…through art. That was simply the best four minutes I’ve spent in a while. Fascinating to watch…an the painting is stunning. Wonderful work. Thanks so much Karen, glad you enjoyed it! YOU are AMAZING! This is the first video I watched! It was MESMERIZING! I wish knew which end of the BRUSH to use for painting! (I suspect the bristles should touch the paper, yes???) KUDOS to you, Peter. I love receiving these newsletters. You DO capture the essence of Vermont! Thank you for your kind words Victoria, and I do use BOTH ends of the brush! The other end works great to scrape lines into wet paint. Wow! It was my first video view and how fun. Perfect timing for this piece today as we will finish up our own sugaring season today. As a small and recreational operation it was a short but very sweet season! Thank you! Hi Christie, glad to hear you got some sweet produce this year, and I am glad you enjoyed the video. Jackson and I are going to add a “video library” to my website here so you can find them all in one place. We have four so fat and will continue to at them at an occasional pace. Thank you so much for your video! It’s wonderful to see how you develop your painting. You always amaze me. I hope you can do more videos now and then. Thank you again! Thank you Edie! Painting out doors, especially in the freezing rain, does wonders to keep you fast and loose. Thank you Sukie, glad we could kindle some good memories together. I too was “helping” my Uncle Bob (Scott) sugar in East Poultney 45 years ago. That old sugar house is still standing, barley. Maybe a future painting. Must be something about people from Brooklyn loving VT. Born and raised in Brooklyn, my wife and I spend summers in VT. It’s the best. Thank you Steve. There is something special about Vermont for sure. I plan to spend the rest of my life discovering it one painting at a time. What an amazing painting, enjoyed the video so much. 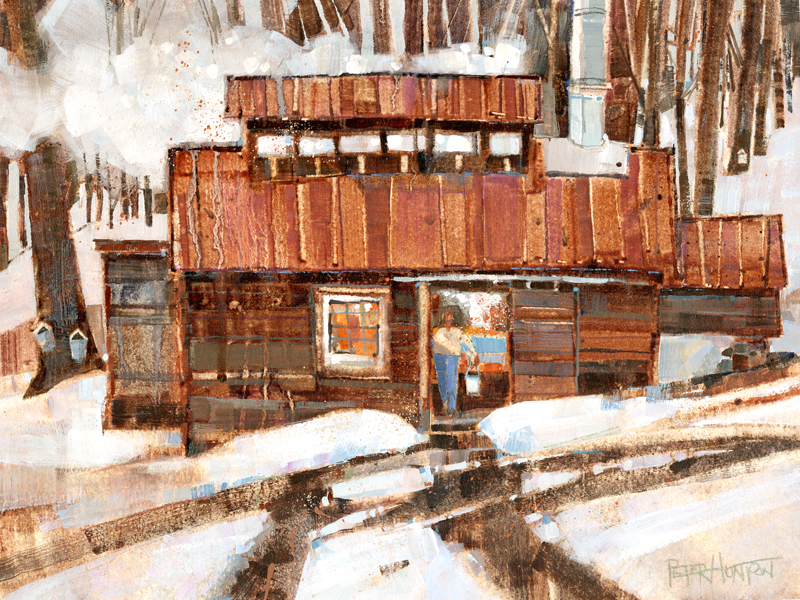 Painting the Vt. sugar house which is just so beautiful and a part of what Vermont is all about!!! This sugar house is just so unique and built with so much talent., an amazing piece of construction and in keeping the old with the new! 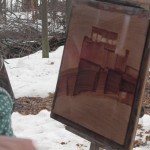 You picked a great subject to paint and captured the beauty of the State of Vt. Thanks for the nice comment Sandy! Mmmm! 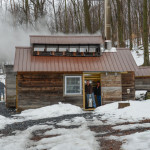 Whatever sugarhouse you pass by fills you with the longing of that sweet smell year round. Billings Sugarhouse on Creek Rd. never fails to bring back or provide those sweet memories. Your picture sure does say a thousand words! Thanks for the “sweet” reminder!